We’ve shared a lot about the Enneagram—a distinct personality theory that categorises people into 1 of 9 distinct personality types. Once you dive into each type though, you find nuances and sometimes, huge differences within each number. So how can you have two people who share a personality type that are completely different? On a recent episode of the Typology Podcast, Enneagram teacher and author Ian Cron spoke about Enneagram Subtypes. They are three instincts that appear in each Personality Type, with each playing a more dominant role to another. Irrespective of our personality, the theory is that each of us is driven by primitive survival instincts —Self Preserving, Social or Sexual. These are behaviours that determine how we approach life. How these appear in each Type is very different, given the unique nature of Type 1 to Type 9, yet these three instinctual subtypes give us grounds to better understand ourselves and work towards health. Ian explains that a Self Preserving subtype is based on a person’s innate need to preserve themselves and escape. If they were to enter a social situation, they would look for a source of food, notice the temperature and look for the exit. A Social subtype thrives on the knowing its place in the pack, so seeks validation and safety in interactions with other people. In a party, they would engage with everyone, ensuring no one is left out and everyone knows who they are. A Sexual subtype prioritises feeling emotions and experiences deeply. They tend to dive beneath the shallows of conversation, feelings and experience to embrace the richness of what life has to offer. At a party, they would locate one person who they can have such a conversation with, and speak with them intimately throughout the night. It’s important to note that while we each have an instinct towards one of these three subtypes, all three play a role in our personality with one often lying dormant or repressed. The layering of these instincts radically shapes our values, and in disagreements we may find that we simply have a different instinctual subtype to our significant other. Take a listen to Ian talk about Instinctual Subtypes with author and pastor Aaron Niequest here. He explains each instinctual subtype and how they function in detail, emphasising how they impact us in relationships. We were most interested in the fact that while each Enneagram number experiences nuanced differences in personality depending on subtype, Type 4 (Aaron) and Type 6 are the most radically different. 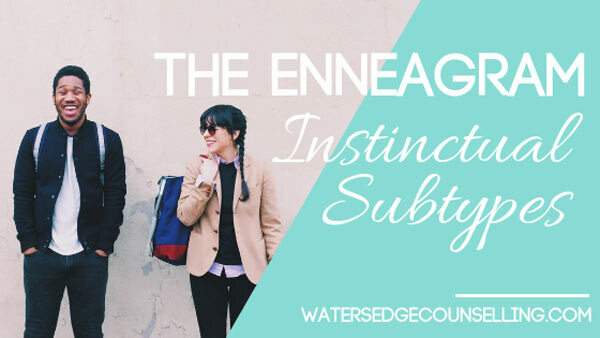 What do you think of Enneagram subtypes? What instinct do you lean towards? Learn more about the Enneagram with our free downloads. Do you want to learn more about The Enneagram? Would you like to better understand how to navigate personality conflicts in relationships? Here’s what you need to do: Contact Colleen on 0434 337 245, Duncan on 0434 331 243 or Rachel on 0422 177 193 for a FREE 10 minute consultation on how we can best help you or book online .